Merc drops two doors for next CLS | What Car? The next Mercedes CLS will be a two-door coupe rather than a direct replacement for the current four-door model. What Car? has obtained a sketch of it and has learned that the design has now been signed off for production. It's scheduled to go on sale within two years. That means there will be two coupes in the new E-Class family the E-Class coupe that goes on sale alongside the saloon in June, and the CLS. Designers admit that left them with 'a big challenge' to differentiate the two. 'The CLS has become a design icon,' one senior designer told us. One of the biggest differences is likely to be in their respective wheelbases. The E-Class coupe is 115mm shorter than the saloon between its front and rear wheels, and therefore considerably less roomy. However, we would expect the CLS to maintain the saloon's full 2875mm wheelbase. 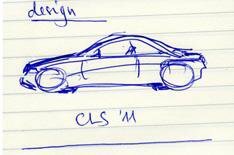 The design sketch shows a typical Mercedes backward-sloping grille, a sharply arced roofline, a rising body crease from just behind the front wheels to the rear wing and aerodynamic fairings behind the front wheels and ahead of the rear ones.